Wendy Leonard, Nature Preserve Officer for City of San Antonio Parks and Recreation Natural Areas, led an enthusiastic group of BAS members on a search for Golden-cheeked Warblers at Friedrich Wilderness Park in northwest San Antonio. With Wendy’s excellent hearing and sighting abilities, she found two Golden-cheeked Warblers for the group, along with Hutton’s Vireos, Black-and-white Warblers, an Orange-crowned Warbler, a Hermit Thrush and Blue-gray Gnatcatchers, among many other species. 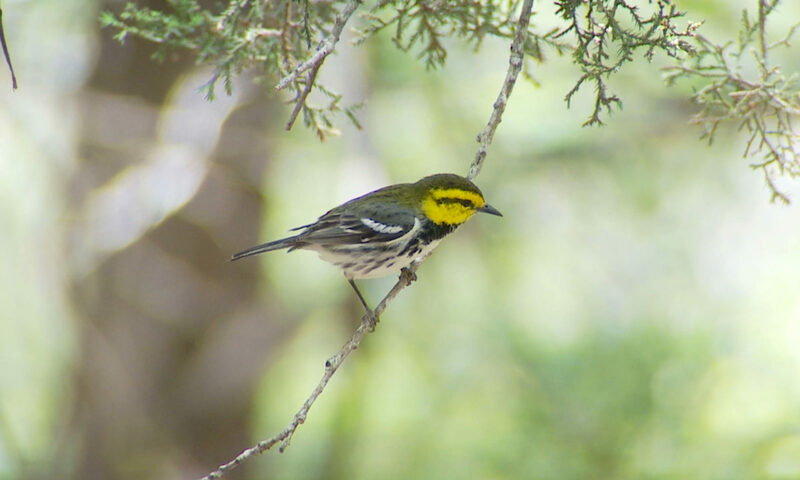 The Golden-cheeked Warbler photo below was taken by Tod Smith during the walk. BAS field trip attendees at Friedrich Wilderness Park on March 21, 2019.